For a year, attending physicians and house physicians at Griffin Hospital, a 160-bed community hospital in southwest Connecticut, conferred daily during morning and afternoon rounds before deciding whether to complete blood counts or basic electrolyte panels for patients on the general medicine floor. The recurring scene was part of a low-tech, small-scale approach to address the ordering of unnecessary labs, determined by the hospital’s Choosing Wisely task force to be one of the chief culprits in unnecessary utilization of medical services at Griffin, which serves 130,000 residents in rural-suburban areas surrounding its facilities in Derby, CT.
“Like most hospitals today, we were trying to do a quality improvement project in terms of bringing down the costs” while ensuring the best patient care, said Valentine Y. Njike, MD, MPH, Assistant Director, Research and Evaluation at the Yale Griffin Prevention Research Center in Derby. The center’s research focuses on prevention of chronic diseases related to obesity, smoking, substance abuse, cancer and violence. The task force consisted of two hospitalists, two house staff physicians and a resident, and was charged with reviewing current practices for ordering blood work and identifying the pitfalls leading to unnecessary CBCs and BEPs on the general medicine floor. The failure points provide guiderails for developing a multi-pronged approach to redress overuse. 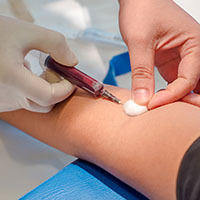 Among the pitfalls that the task force uncovered were that physicians were at times unaware of previous lab testing and the results, no rationale was required to order labs and were repeated on an automatic basis, and nursing or call teams assumed that patients with no labs indicated in their charts were missed by the primary care team. The task force followed Choosing Wisely recommendations from the American Association of Critical-Care Nurses, American Thoracic Society, the American College of Chest Physicians and the Society of Critical Care Medicine. Its members turned to medical literature to review existing studies that implemented a similar set of interventions, including education and data feedback with peer comparisons, to reduce unnecessary labs. To address overuse, the intervention required medical teams to discuss labs needed for the next day in the morning rounds and during follow-up rounds in the afternoon. They also had to include in progress notes documentation for why labs were needed, and the teams received weekly feedback on the number of labs ordered per patient days and how they compared with other medical teams. For residents whose documentation in support of ordered labs was not considered appropriate, program leaders provided direct feedback. In addition, residents participated in lecture series on high-value care as part of their curriculum, and informational flyers were sent out as reminders about the new protocol of discussion prior to ordering labs. After a full year, the average number of CBCs and BEPs per patient days each dropped by nine percent, statistically significant in both cases. The intervention did not affect the length of hospital stay or the mortality rate in patients, or trigger unintended adverse consequences. The number of BEPs avoided in the first month totaled 1,189.6 and the volume of blood not drawn was nearly 4,600 cc. The number of CBC tests avoided was 230.6, and the volume of blood not drawn was just over 922 cc. Even with their success, Njike said that keeping residents abreast of the new protocols was a challenge for the project. “The turnover of residents is actually one of the biggest problem. They are not that continuous,” he said, adding that changing shifts required extra effort in keeping practices consistent. Do You Know about the Choosing Wisely Learning Network?